While accompanying colonial expeditions, Health Service officials discover an unknown world of plants of which they will make an inventory. The physicians and, especially, the chemists of the navy had begun to do it; those of the Colonial Health Service are going to go further. The objectives are clear enough but the means of study are rudimentary, especially in the beginning. The purpose of drawing up a botanical inventory and developing certain arable lands is to discover and cultivate plants that are interesting for economic reasons, those that have therapeutic properties and those useful for nourishment. These undertakings have promoted the development of French pharmaceutical research by furnishing plants which are raw material for the production of new medicines. When colonisation begins, the main object of the study of plants is to provide Metropolitan France with useful products of tropical origin for nourishment or industrial purposes. Attempts to grow tropical plants in Europe having failed, they must be cultivated in their countries of origin or transplanted in similar soils and climates. Spices, precious woods, plants used in dyeing, followed by cotton, rubber, coffee and cocoa, rice etc... grown in the colonies, assure France of unvarying quality and total independence in its supplies. It is also a matter of discovering, in this unknown flora, new medicines to improve the therapeutic resources used at the end of the 19th Century, which are themselves derived from plants. Very soon, plants used by native healers become objects of research and sometimes lead to the development of more efficacious mediciness. But, round about 1910, the development and the initial success of synthetic chemicals relegate natural substances to a place of secondary importance. From 1935 onwards, a new interest in the analytical study of tropical plants is manifested, especially those plants that are known to have pharmacological properties. Foremost among them are traditional poisons, poisons used for fishing, for poisoning arrows in hunting and war, poisons used in ordeals to establish justice or in initiation ceremonies. The investigation of the properties of plants is not the prerogative of the Colonial Health Service. Eminent agronomists and scientists, notably A. Chevalier of the Museum of Natural History and E. Perrot, Professor at the Faculty of Chemistry in Paris, play an essential role, bringing to this enterprise their great competency and the service of their well-equipped laboratories. Nevertheless, colonial physicians and chemists are always around, especially in the study of medicinal or toxic plants. However, we must distinguish between those whose mission it is to do this work (and they are few) and who are dispensed from all other services and those (much more numerous) who, being engaged in service, only take up an investigation occasionally; without great means at their disposal and in the time available to a colonial chemist with multiple obligations. Both the former and the latter have performed their research work in very difficult material and sanitary conditions and many of them have died in service after having contracted tropical diseases (Geoffroy* in 1894, Prince* and Raoul* in 1898, Lafitte* in 1940). From the beginning of colonial expansion, exploratory missions are accompanied by a military physician or chemist who is given the responsibility of making hydrographical surveys and of drawing up inventories of natural resources - minerals, plants or animals - in the discovered regions. Ballay* and then Liotard* accompany Sarvorgnan de Brazza to Congo; Liotard* is with the Gallieni mission to Sudan; Raoul* accompanies Admiral Courbet to China, then he makes an inventory of useful plants in the West Indies, the Pacific Ocean and the Indian Ocean. Lasnet* makes an inventory of the plant resources of the Ivory Coast and Senegal. Prince* does the same in Madagascar, where he dies in 1898, at the age of 31, the victim of a tropical disease. 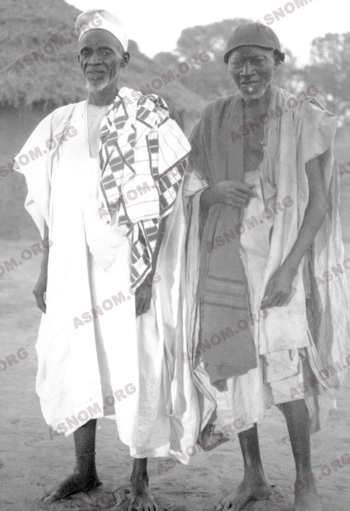 In 1935, the Administration of French West Africa (AOF) creates a "mission for the study of indigenous materia medica" confided to Lafitte*, a chemist who has great experience in the botanical field, who gathers hundreds of plants and publishes a catalogue giving their scientific and vernacular names, their geographic origin and their medicinal use. This work is accomplished in collaboration with A. Chevalier of the Museum of Paris. This inventory necessitates close and trustful collaboration with native healers and interpreters in order to know the place where the plant is harvested, the part of it that is used, the method of preparation (maceration, infusion, decoction), the composition of mixtures, the quantities prescribed. The botanical identification and the general characteristics can be determined on the spot. As for extraction and isolation, that can only be done in well-equipped laboratories such as those of the Overseas Pasteur Institutes and the Pharo Centre of Research, as well as in the laboratories of the Museum or those of the Chemistry Faculties. 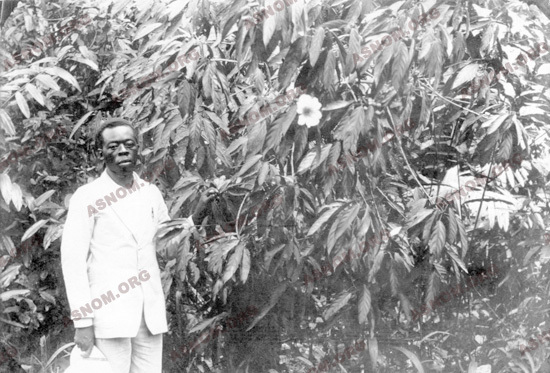 After the Second World War, with the same enthusiasm, The Overseas Office of Scientific and technical Research (ORSTOM) gives two colonial chemists, Kerharo* and Bouquet*, the mission of studying traditional materia medica in the Ivory Coast and Upper Volta. From 1945 to 1947, they obtain from healers information about the use of over 700 plants and send more than two tons of samples to competent laboratories for analysis and pharmacological research. In 1957, The Higher Council of Scientific Research sends a new mission to the Ivory Coast, directed by Bouquet* and Debray*, which has greater technical means to perform chemical analyses on the spot; 2 000 analyses on 700 species are performed; 484 plants - that is to say, more than 5 tons - are gathered, dried and sent to Metropolitan France. Kerharo* pursues his investigations in Senegal and Bouquet* in Congo. They publish a general survey of their work in many books and documents. Inventories of traditional materia medica are drawn up in Indochina by Sallet* and Guichard*, in India by Giboin*, in Polynesia by Pétard* and in Madagascar and New Caledonia by Debray*. The inventory must be completed by providing the means of cultivating useful plants, so as to assure a sufficient and regular supply. To avoid long and perilous voyages, planting is attempted in France. Numerous botanical or acclimatising gardens are created in the nineteenth century, notably in Paris (Jardin des plantes), in Marseilles and around marine hospitals in Rochefort, Brest and Toulon. These attempts end in almost complete failure. Obviously, a plant must either be acclimatised in a colony where the soil and climate are practically identical to those of the country of origin or similar species of plants furnishing the same products must be found in comparable soil in other colonies. Research is also actively pursued in these countries on useful plants or plant species which furnish similar products. The will to reduce burdensome importations and to acquire independence of supplies leads to the research on plants of economic interest in French colonial territories. Agronomists and eminent scientists, as well as some physicians and chemists of the Colonial Health Service, are given the responsibility. Thus E. Raoul* is given the huge task of introducing new plants into the colonies of the Indian and Pacific Oceans (coffee, vanilla plants, spices) and creating a botanical garden for acclimatisation in Tahiti. After this first mission, which lasts nearly three years, Raoul* sets out again in1897 with the intention of collecting rubber seedlings and plants that yield gutta-percha in Indonesia (Sumatra and Java) in order to grow them in our colonies. The trees yielding gutta-percha are the source of a latex used in surgery and, above all, in electricity for, at that time, it is the best isolator of electric cables both above ground and under water. He introduces into Indochina the first rubber seedlings. Yersin* will continue their acclimatisation and will contribute towards making rubber a source of wealth for Indochina. Back home from his mission, wasted and weakened by fever, Raoul* will die at the age of 53. Rançon*, given the task of finding plants yielding latex, travels up and down Senegal and Sudan. Geoffroy* looks for the same trees in Guyana and Martinique and studies a robinia (a genus of leguminous trees) used as a poison in fishing by Indians of the forest of Guyana. This work is the subject of his thesis which is published posthumously, for he dies in 1894 of parasitosis contracted in Guyana, at the age of 32, before he can defend his thesis viva voce. Pursuing these undertakings, Lafitte* later looks for sources of energy in tropical plants : fuel from local alcohol, combustibles from groundnut shells. Shea butter, from a tree in the Sahel, is proposed for use in the preparation of ointments (Lancepleine*) and for cosmetology. At the beginning of the colonial era, physicians and chemists are intrigued by the prescriptions of local healers, which are often derived from plants. Some of them test the efficacy of these remedies. Thanks to the inventories made and pharmacological studies, medicines that are efficacious are perfected and used, particularly during the 1939-1945 war, when health supplies are interrupted. Giboin*. Bontems* extracts its active principle from it. Philibert* creates a medicine and the plant is named in the Codex. 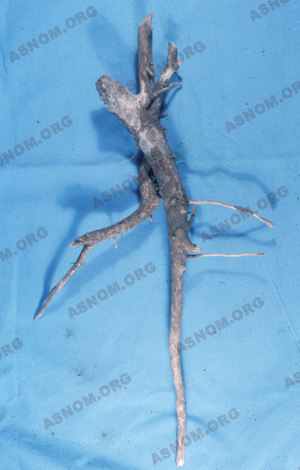 Its essence is commercialised as a pharmaceutical speciality, it is used to treat phagedenic ulcers. Plant extracts are studied by Ferré*. Some are good for lactation (Tsembal from Cameroon), others are efficaceous against intestinal worms (Dahomey Chenopode, Madagascar Voatamenaka). Antihypertensives, vasodilatators, curarizings, etc... are thus isolated, but they do not all end up as medicine. Some of these plants can be used to create medicines : thus, the anti-amoebaean properties of Euphorbia hirta (Ridet* and Chartol*) are used in the elaboration of a pharmaceutical patent medicine, "Socamibe", and the "séoulou" whence Trenous* and Tanguy* derive connesine which too is very efficacious (Durieux*) and commercialised under the name of "Roquessine". These preparations disappear with the advent of metronidazole. Lafitte*, in Pondichery, imports from the Malabar Coast a tree of a species related to that which furnishes chaulmoogra oil, the unique treatment of leprosy before the introduction of sulphone drugs in 1942. Oil extracted from fruits is of superior and unvarying quality and its cost price is much lower. The plantations established around Pondichery are not sufficient to supply the needs of all the leper-houses of the Colonial Health Service; the fruits of the tree must be imported. Peirier*, in Cameroon, reports the anti-leprous properties of the fruits of the Caloncoba and Ferré* proposes their preparation in the form of Gorli oil which was used during the 1939-45 war when chaulmoogra oil could not arrive from Pondichery. Rivoalen* in Sudan uses the same Gorli oil. The introduction of cinchona into French colonies is a great success. In Indochina, Yersin* gives its cultivation particular importance. The extraction of quinine and the preparation of soluble and injectable salts on the spot are realised by Deniel* and Clémensat* during the Second World War. 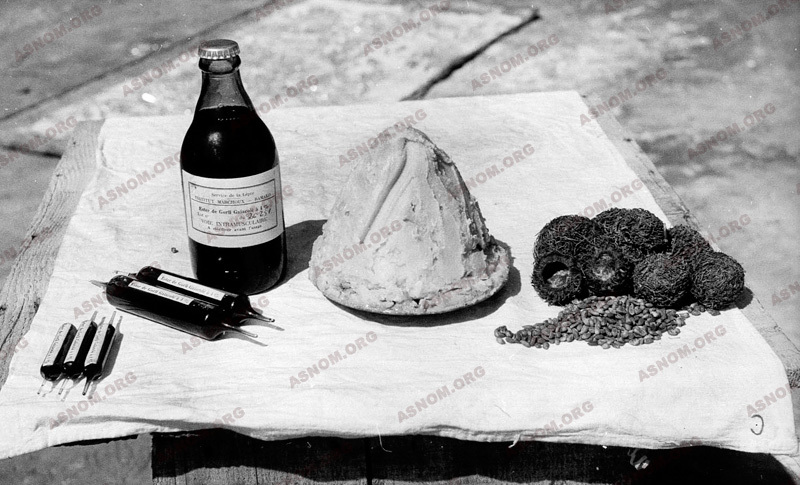 The supply of quinine necessary for Indochina is assured until the advent of synthetic anti-malarial drugs. Cinchona is planted successfully in the Ivory Coast, Cameroon, Madagascar and Polynesia but the plantations remain at an experimental stage. Traditionally used poisons of plant origin are also studied. They contain substances whose isolation has already led to the preparation of many sorts of medicine. 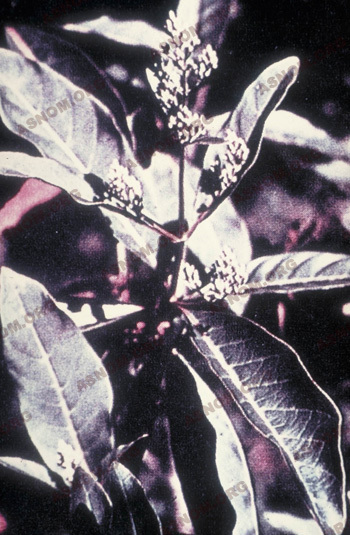 Curare, widely used in medicine and surgery, is a poison of plant origin used by the Amazonian Indians. Strophanthus and ouabaïne, remedies for cardiac insufficiency and now no longer used, are extracts from poisons used by Somalis for hunting. In the north of Gabon, there is a small shrub, the Iboga, the bark of whose roots is stimulating and, in strong doses, hallucinogen. These properties are the basis of initiation ceremonies reported by Barabé*. The anti-asthenic effect has been used to introduce the alkaloids of Iboga into certain medicines. Although the transfer of plants progresses and the wealth of certain colonies increases thanks to sugar cane, coffee, cocoa, and oleaginous products, malnutrition persists in the poorest territories. The fight against malnutrition, taken up after the Second World War, necessitates the study of all nutritional plants, both traditional and imported: drawing up inventories, botanical identifications, chemical analyses and the gauging of nutritive values. Research is made to evaluate the extent of malnutrition and to improve child protection, especially by having recourse to local plants. These important tasks are performed by the teams of Raoult* and Toury* at the ORANA and lead to preparations whose acceptability is investigated. Campaigns to promote these nutritional complements are launched. The major problem of protein deficiency leads colonial chemists to the study of the quality of the proteins to be found in local foodstuffs. The abundance of proteins in leguminous plants and of vitamins in fruits and most vegetables is revealed. At the same time, the team led by Busson* at the Pharo establishes new charts of food composition which now serve as an international reference. - Raoul E. : Manuel pratique des cultures tropicales et des plantations des pays chauds. Challamel Edit. Paris 1894. - Laffitte N. : La pharmacopée indigène en Afrique Occidentale Française. Les grandes endémies tropicales. 4 avril-6 mai 1938. Vigot Edit. Paris 1938. - Kerharo J. Bouquet A. : Plantes médicinales et toxiques de Côte-d'Ivoire et Haute-Volta. Vigot Edit. Paris 1950. 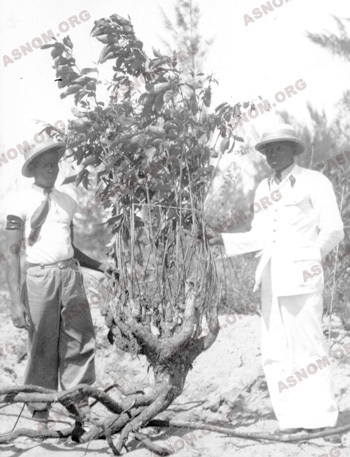 - Debray M. Jacquemain H. Razafindrambao R. : Contribution à l'inventaire des plantes médicinales de Madagascar. Orstom.1966.